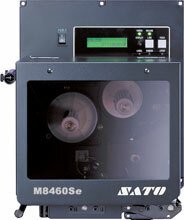 SATO has announced the discontinuation of its M8460Se, M8485Se, and M8490Se industrial print engines and all of their related accessories. Reason for Retirement: The NEW S84ex/S86ex series was released in November 2014 which has a superior feature set and is a compatible replacement for discontinued units. Last Time Buy Order: Dec 30, 2015 – Estimated date based on availability depending on model. Effective Immediately: M8465Se RH Standard and LH Opposite and M8459Se are out of stock and discontinued. End of Service: December 30, 2020 – Spare parts and service will not be available after this date.